Created by perfumer Andy Tauer, Orange Star contains notes of clementine, red mandarin, lemongrass, orange and violet flowers, ambergris, soft woods, vanilla, patchouli, and cistus (Ambreine). Orange Star starts off with syrupy (sweet) citrus aromas (this is not sparkling or “fresh” citrus) blending with a slightly bitter lemongrass note — a very lush, but fast-fading, opening. The orange blossom in Orange Star’s mid-development is neither twee (nor too clean)…it’s roughed up, and quickly subdued, by cistus. As with many Tauer fragrances, there is a long-lasting dry-down of incense-y wood notes and potent amber (with lots of vanilla, patchouli and ‘leathery’ cistus). The Tauer Perfumes base is very distinctive and strong (similar in endurance and intensity to Montale’s oud base); it often overwhelms the head and heart notes in Tauer fragrances. During Orange Star’s extreme dry-down, all notes soften and veer towards “powdery,” but powdery in a good way — you won’t choke on powder, you’ll feel “polished” by it. Orange Star smells “dressy” and handsome — a tad conservative. When I smell it, I think of a Victorian gentleman (or lady) who is beautifully dressed and groomed: bathed with a bar of Eau de Cologne soap, powdered with an orange blossom talc, anointed with strong amber perfume (and whose frock smells faintly of fireplace smoke). Orange Star has excellent (verging on ‘miraculous’) lasting power and sillage — even with just one spritz; if you don’t like powerhouse perfumes, stay away from Orange Star. Depending on your tastes (or climate), Orange Star may be too potent and rich for summer wear. 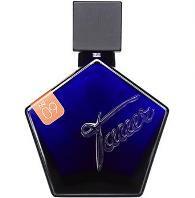 Tauer Perfumes Orange Star Eau de Parfum is $120 for 50 ml — in my opinion, a lifetime supply; for buying information see the listing for Tauer Perfumes under Perfume Houses. 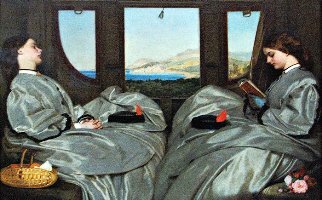 Note: top image is The Traveling Companions by Augustus Leopold Egg [cropped] via Wikimedia Commons. Wow. That’s so interesting. I’m not getting a fix on this at all from the various reviews, and least of all from Andy himself who called it “fresh.” Look forward to sniffing it out for myself, though! Wasn’t sure if I liked it or not when I first sampled it. Second time I sampled it, I did wind up liking it. I think your review is dead on. I almost purchased this unsniffed (WHEN WILL I EVER LEARN)…but wound up joining a split. I’m happy with my 10ml decant. Carlos: that’s all you need…this is like extrait! HA! The reviews seem to vary wildly on this one – can’t wait to sample it. Cazaubon:I guess I should go read what others are saying! I’m looking forward to trying this – especially after following the progress of it on his blog for a while. I am such a devotee of Andy the Man that I am happy to throw money his way when I can, and I do like most of his scents. Nice review – it sounds more autumnal than summer, for sure, but we have such cool summers here in SF I don’t feel like I need to wait to sample it. Tama…true, you’re cool till October! How strange! On me the opening was a big glowing orange mandarin, very juicy. Unfortunately the base was right upon me, it reminded me of a watered down tauerade, and on my skin it felt dusty rather than powdery. I didn’t like it, but it *is* a unique take on the cologne genre…a genre that is not meant to excite me, unfortunately! In any case I like Tauer perfumes in general and love l’air du desert and une rose chyprée in particular! Zazie…”cologne” as defined by, what?, Martians?! Oy! Well you know… the citrus top, the light heart and base: unlike you I perceived it much more watered down than the typical Tauer, and similar in feel to a usual cologne, just a bit heavier and very tenacious (it is not the only tenacious cologne I can think of, though!). It makes perfect sense to me that the scent was initially developped for a soap, and colognes were used for hygene in the past! So I might be that martian, defining OS as cologne, but I stick to it… indeed I do seem to have a greenish skin undertone today! Oh yes, I’d love to see the URC inside the new bottle design… a tiny blue 15 ml bottle would be so cute!! I’m not an uRC fan (yet) but I agree, a 15 ml bottle in the new design would be too cute to pass on! Bee: the blue bottle is nice. I love orange but this didn’t supply it as I was hoping it would. This is the “orange” of amber. I don’t generally wear many citrusy cologne fragrances but I recently purchased Orange Sanguine which is very nice. It sounds like it is different enough to be worth a sample. I do love his fragrances and have had my eye on Maroc pour Elle for a while. Bee – I also wish Une Rose Chypre was in a prettier bottle, but it is so beautiful (and powerful) that it doesn’t really matter. I’ve only tried a full spray in the privacy of my own home. His fragrances do have miraculous staying power so I usually use a little vial I decanted for dabbing and keep the rest packed up. I’ve been waiting for the NST review of Orange Star. I love all of AT’s scents, but not being a fan of orange, I’m on the fence. Doesn’t mean I’m not going to sample it, but orange? hmmm. I love your review, very evocative and pulling my heart in the direction of ‘try this, pick me.’ I’m thinking of your Victorian comments, ‘dressy and handsome’– so well put. The bottle is the bomb. Love the Traveling Companions image. Ditto all of that! I enjoy the Tauer base and LOVE IE, IR & L’air (on my husband, but still) but I really don’t like orange as a note… or is it just that the right orange hasn’t come my way yet? Maybe this will be it? This review really pushes it closer to the top of my to-sample-list. meadowbliss: don’t let the “orange” in the title scare you…it ain’t a literal orange/fruit by any means. Oh, this one was a major disappointment for me. I really didn’t care for it and I didn’t get orange at all. On me, I think it’s the lemongrass note that was very predominate and it was all rather strange and disconcerting. Thanks for this. I use a hair product that leaves too much lemongrass scent behind and it really bothers me. I love lemongrass – but only in food. I have been known to run off and buy a FB of something that strikes my fancy, but I’m trying hard not to do that anymore. Imaginary Joe has been sitting on my shoulder for some time now telling me to enjoy what I have and not to buy something without fully testing first, so I think I should listen. Esp. with the Tauer fragrances as they do have miraculous lasting power. I was so tempted to participate in an unsniffed split, but happily, decided not to. I will be passing my sample along – someone else could love it! I also enjoy lemongrass in food [it’s a MUST ingredient in a sea soup that I make], but it didn’t work with my skin chemistry. I love lemongrass!…please, what is this sea soup? I must have it! I don’t want it in my perfume. It’s just a little something that I throw together with onions, garlic celery, tomatoes, white wine, corn, shrimp, lump crabmeat, haddock [or red snapper], lemon juice, lemongrass, whole coriander, red pepper flakes, sea salt & fresh ground pepper. I think that’s everything. Rustic: I liked the lemongrass note but it didn’t hang around very long. I’ve tried every Tauer and as a general rule, I loooooove his scents. Desert Morocain, both Incenses, Reverie, Rose Chypree… they all knock my socks off. But for some insane reason, I just haven’t been lemming Orange Star. I don’t know why. I just keep on ordering other samples instead of this one (unfortunately I’m not close to a brick n’ mortar where I can sniff). But I sure AM lemming one of those new bottles. They are bee-you-tee-ful!! Clarification: I should have said I’ve tried every Tauer OTHER than Orange Star. D’oh! K-Scott — you and I must be Tauer Twins…I like all of the same ones that you do!! Just got a shipment from Andy (new bottle of L’Air and he informed that I am the first to order that scent in the new bottle!!) and I have a sample of Orange Star. Will sample over the next week and report back. Loved the review, Kevin. I was wondering when I’d read about Orange Star! I just put some on now to follow along, and we’re definitely walking the same path. First time I tried it, I applied a couple of drops. Big mistake! Instant overkill. It was too much of everything and, being Andy’s creation, it’s got a half life of two or three days, so it’s nuts. Now I use a quarter of a drop at a time and it makes all the difference. I love, love, love it now. Just wanted to mention that to any Tauer fans who are tempted to apply with enthusiastic abandon. A little goes a long way for a very long time. Lifetime supply is right. We adore you, Andy!! Thanks for another fascinating little fragrance “world” to explore. memechose: I’d love a soap in this scent…I can abide so many things in soap I can’t wear as perfume. I’m still working with my sample. I like it but don’t know if I need it. First I thought it felt like a Tauer fragrance sort of hollowed out or unfinished. Longevity is good and I was finally left with the impression you describe. I like the soap- citrus-floral-fruit-resin feel it has minus sparkle, as you point out. Gives it a weird appeal- like charcoal dip incense in a drawer. I can definitely see this one working as a soap or candle much better than it does as a personal fragrance. The slightly zingy citrus opening is nice, but it morphs almost immediately into…I hate to say it…liquid fabric softener scent on me. It’s not awful by any means, but if I want to smell Downy’s April freshness, I can sniff my clothes. Dear (one of my favorite operas): there IS a creamy/liquid center to this one. I got precious little orange anything out of this one. Is that oily, creosote-ish note the lemongrass? Well , that’s the note than went ROGUE on my skin. ….I love Incense Rose, I love love love Une Rose Chypree…..Orange Star needs to keep its distance or there’s gonna be trouble. Daisy: it’s sort of fun when a great scent comes in a plain little bottle, isn’t it? For most often we get crap in overdesigned packaging…. I should add that Andy’s stuff is always interesting, even if it’s not “me” or something where you cry out “it’s sooo pretty! I’m going to wear it everyday forever! ” —Andy never bores you, it’s always a must sniff and even though I don’t “like” Orange Star, I’d feel somehow disadvantaged if I never got a little bit to try. I think AT is a force in the world of niche perfume and I believe other perfumers are very aware of everything he does. you know I did the same thing—in my fervor I practically tore the packaging open with my TEETH! and immediately SPRAYED two bigs zots right onto myself completely untested ( brave or stupid, it’s a tough call) umm, I almost got kicked out of the house…. You didn’t get your Tauer lesson from URC?? Silly thing. haven’t we already established that I never learn? 3rd bottle, Daisy? No split-offs? I wish I can spritz with your kind of abandon! Unfortunately, I’d get nothing but complaints if I spritzed liberally enough to go through 3-15ml bottles of perfume strength fragrance in such a short amount of time considering everything else I have in my rotation. 2 days ago, I had to go out into the hallway to diffuse 2 drops of Montale Gold Flowers applied to the wrist (I know- it’s Montale…) because the office neighbor complained it was too strong. in my defense….and in defense of my associates’ nostrils…I’ve only just begun bottle #3…and I did split up most of bottle #1….they’re only 15ml so it doesn’t take a lot of splitting for a bottle to be done….and my daughter likes it too. But yeah, some days I gotz me som sillage! Smelling like a well-groomed Victorian from time to time sounds like fun. I will sample this and hope I like it well enough to acquire one of those cool bottles! By the way, I bought the Buddha’s Fig that you reviewed, Kevin (essentially free on Amazon I haven’t really tested the longevity yet, but I actually like this version of fig as well as any others that I have sampled, and better than some that are far more expensive. Thank you for that review, too! yes….between Kevin, Angela and Jessica ; I’m not only well cleansed but well perfumed….and umm, poor. Daisy: that might work for me too…HAIRY patchouli? HA! I’ll call it DIRTY patchouli, thank you! noz: oh, good..glad it worked out! Nice review, Kevin. It really helped dissect this one for me. And I like the image of your Victorian lady or gentleman to illustrate OS’s wonderful soapy-incense-y stage. Also love the opening, while it lasts.